Africa is poised for third wave of growth that could return it to the Africa rising heights that preceded the global financial crisis. These are some of the highlights from a report released by Barclays Africa in Nairobi on their macro economic outlook for 2017-2018. Barclays Africa Chief Economist Jeff Gable said that global growth was 3.7% and is at its strongest in 5 years with the growth synchronised in all regions – US, Europe (strongest in a decade), Asia (recovering from 2017), and Latin America (coming out of recession). Global concerns include the politics of rage and nationalism waves, US political uncertainty (with President Trump), China’s economic adjustments and fluctuations in commodity demand. Africa has shown itself to be resilient and is receiving foreign direct investments (FDI) flows at levels not seen in a decade. South Africa gets the top share of FDI (followed by Morocco, Egypt, Nigeria, Kenya), with most deals coming from the USA – 91 investments (followed by France, China, UK, Dubai) but with the largest source of funding, by far, from China ($36 billion). Gable sees African countries as better able to address macro economic conditions this time around, such as through making infrastructure pay off by focusing on smaller affordable achievable projects (such as Uganda oil and Tanzania gas), diversifying commodity-driven economies, and managing foreign exchange and debt with the lessons learnt from the earlier dip. He expects that a majority of African countries will continue to grow at a faster pace than in recent years and that average growth will be 4% across the continent. Some risk concerns are that not many African countries can afford to pay for what they are spending and they are exposed to continued outside borrowing at a time that Sub-Saharan Africa credit ratings are declining and there are discussions about uncertain macro economic policies from Angola, Mozambique, Nigeria, Tanzania South Africa, and Zambia as well as other discussions on political strains in Ethiopia, Kenya Tanzania, Uganda, Zambia, and Zimbabwe. Another concern is that climate change will disproportionately affect Africa. 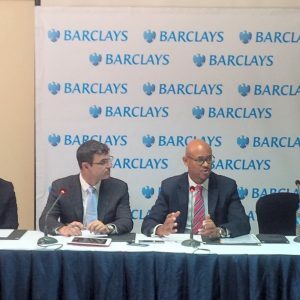 Earlier in the day, Barclays Bank of Kenya Managing Director, Jeremy Awori cautioned on the year-old interest rate cap law in Kenya that had constrained private sector growth, and bank earnings He said banking industry earnings had shrunk 8% as at the third quartet of 2017, compared to average growth of 15% in previous years and that private sector credit may have shrunk during the year. Barclays Africa Macro Economic Report launch. Kenya’s credit rating has been stable since 2010, but Moody’s are now reviewing it for downgrade (due to to large deficits, high borrowing costs, and policy uncertainty). What concerns Moody’s is not Kenya’s debt size, but its replacement of long-term concessionary debt with short-term commercial debt. Barclays Africa forward exchange rate forecast for the Kenya shilling to the US dollar is 106 at the end of 2018, 108.5 in 2019, and 110.8 in 2020. Interest rate caps have been tried in many countries besides Kenya. The intent is the same, but Kenya’s Central Bank won’t be able to do anything about interest rate caps until next year. For Kenya, tourism and agriculture (after the drought) are moving up, but manufacturing is lagging, and the Purchasing Managers Index (PMI) showed dramatic improvement in December 2017 after plunging to lows in October 2017 during the election season. The annual Macro economic report was produced by the Barclays Africa research desk. It will be followed by another release by Barclays – of their Africa Financial Markets Index which is a survey of 17 African stock markets. This entry was posted in africa venture capital, bank service, Barclays, Investing in Kenya, Kenya economic growth and tagged Africa Rising, Barclays on January 17, 2018 by bankelele.